You are here: Todd Jagger's Photo of the "Marfa Lights"
Return to details of the "Springs Lights"
Todd Jagger's Photo of the "Marfa Lights"
Photographer Todd Jagger, who does some really nice photographic work, posted his photo of the "Marfa Lights" on an Elbow Canyon blog page. He described his experience and his photo of the "Marfa Lights" and gave a tantalizing piece of information. He revealed the photo was a 16 second time exposure. Well, let's do a little "CSI" (Crime Scene Investigation), or forensics, on this photo, even though CSI is an incredibly poor/lame TV show...but that is another story entirely. Below I explain how I can determine this is not a photo of "Marfa Lights" but instead is a photo of car lights on Highway 67. What follows makes a several assumptions, but they are sound assumptions from physics and photography. The bottom line is that the results are also "sound", that is, if the results were way off what one would expect, then I could not draw my conclusions. What follows relies a lot on elementary physics, geometry, and photography and if you find I've made any errors, please let me know! I was able to contact the photographer and though very unhappy I was using his photograph, he was kind enough to confirm the photo was taken from the "official" viewing site outside of Marfa, Texas and that the camera used was a digital, 28-84mm (35mm equivalent) zoom with the ability to expose for 16 seconds. (An automatic exposure this long in a consumer digital camera is very unusual!) Unless I get more details however, I will have to make an assumption about the focal length (zoom) used. Given the size of the red light and white lights in the photo, it is likely that the photo was taken in the 3x mode. The cameras widest field of view would be the 28mm (equivalent) setting, resulting in a horizontal field of view of about 65 degrees. At 65 degrees, and the photo not cropped, the red light and white lights would have been a very tiny dots in a much larger photo, after all the red light is over 12 miles from the viewing area, and the cars even further. Thus, I estimate the camera was in the 3x setting (84mm equivalent) which provides an image of the red light very comparable to other Marfa photos. A 3x (84mm) setting would make the apparent horizontal angular field in the photo about 23 degrees. I will take this into account in the assessment and computations below. The photo appears cropped as it does not have the aspect of a typical digital frame (typically 1.5 to 1). I will estimate that the cropping was more vertically than horizontally, (this is evident from the h/w ratio of the photo), and make the further assumption that the horizontal span was cropped somewhat from the original photo, leaving a horizontal span covering somewhat less than the entire available span of the original frame. I believe it is safe to say that the photo spans about 23 degrees horizontally. This is in good comparison to other "Marfa Lights" photos taken from the "official" viewing site. Any further horizontal cropping would make the horizontal span of the photo even less than 23 degrees. This is likely my crudest assumption, but, as it turns out, does not really matter much. More on this later. Now let's pull this all together and see what we can find out. Let's first talk about cars. Specifically, moving cars. If a car is traveling 65 miles per hour, (not an unreasonable speed for cars on the stretch of Highway 67 at night), visible from the "Official" Marfa Light viewing site [see my description of the Marfa area if you did not already view that page], how far would it go in 16 seconds? 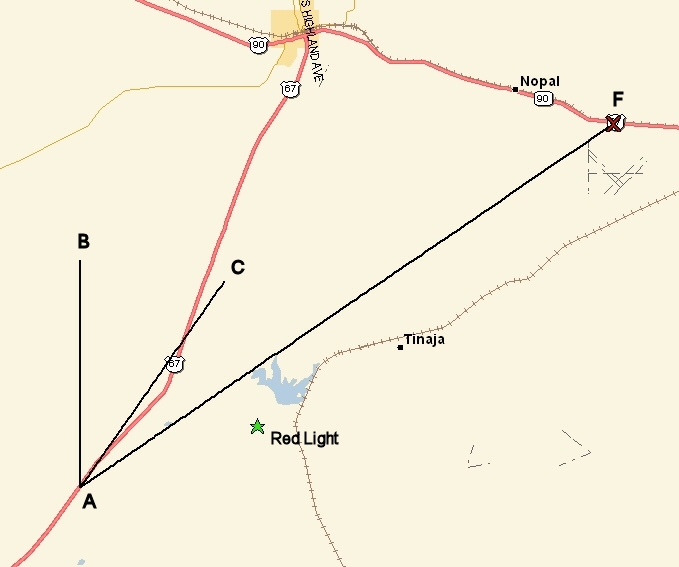 Now from the geometry of the "Marfa Lights" in Fig 16, above, in relation to the "red" light in the photo, the white lights in the photo appear to be in about the same location as those in other Marfa photos. 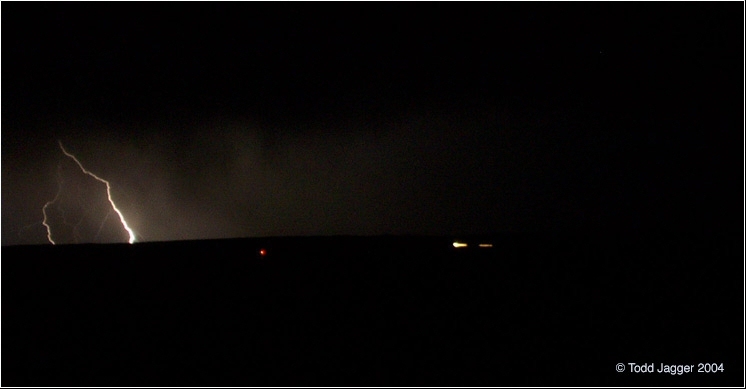 The white lights are seen to the right of the red light, and very nearly in the same horizontal plain and we know the shot was taken from the official viewing area. This allows us to compare the photo to other photos taken from the same location. If we argue the "Marfa Lights" in the photo are on the same section of Highway 67 as in other Marfa photos and compare the estimated geometry with Fig 17, below, we can draw some conclusions of the distances and what we would expect to see. From the geometry, I conclude the white lights in Fig 16 are in the area of "A" in Fig 17. The distance, A-F in the figure, then is about 17 miles. We have seen that along this section of highway, a car traveling 65mph would go 0.29 miles in 16 seconds. Now the motion of the car would, naturally, be along the highway, which I've exaggerated in the next figure, Figure 18, as the green segment A-D. But wait! In the photograph (Fig 16), the movement of the car will appear foreshortened presenting an apparent distance traveled which is shorter. The foreshortening is due to the fact that the car is not traveling exactly horizontally across your field of view, rather at a fairly steep angle "toward" you. I've illustrated this foreshortening (again, exaggerated) as the blue segment, D-E, which is perpendicular to the segment A-F. (If you have trouble visualizing this, hold a pencil horizontally in front of your eye - then tilt it toward you and watch how the apparent length of the pencil shortens.) The apparent distance, D-E, is the distance A-D shortened by the cosine of the angle A-D-E. So, let's figure this out. As drawn on Fig 17 and Fig 18, segment A-B is pointing due North. The segment, A-C, is drawn to follow the highway at this section of Highway 67. The angle, B-A-C is 35 degrees. The angle B-A-F is 56 degrees. Thus the angle C-A-E is 21 degrees. Since angle A-E-D is a right angle, that makes A-D-E 69 degrees. Since we know the segment A-D is 0.29 miles long (the distance a car travels for 16 seconds at 65mph), then the segment D-E is the cosine 69 degrees times 0.29 which is 0.1035 miles. So the segment D-E is 0.1035 apparent miles as seen from the viewing location F.
What we need here is the apparent angle subtended by the segment D-E. We have the estimate that the cars are 17 miles away, and since 0.1035 miles is so small compared to 17 miles, the arc length of this segment is the arctangent of 0.1035/17 or 0.35 degrees. Thus, cars which traveled 0.29 miles in 16 seconds at 65 miles per hour, would APPEAR from our observation point at F in Fig 17, to have traveled 0.35 degrees horizontally across our field of view. (Bear in mind that the segment D-E in Fig 18 is actually much closer to point A. The drawing had to be exaggerated to make the point.) At this point we know, without even looking at the photo, that a car traveling on Highway 67, approximately in the area of point A on Fig 18, would APPEAR to travel 0.35 degrees across our field of view, in 16 seconds, from 17 miles away. Now let us do some more CSI on Figure 16, Marfa Lights photo. I have assumed the photo is about 23 degrees across. The photo is 746 pixels across if you look at the digitized photo data. If you view the photo in some imaging software, you can determine the light streaks are 13 pixels long. What we need to do is determine how long these streaks of light are in degrees of arc. This is easily estimated. Since we have (by a good assumption) the angular width of the photo (23 degrees), and we know the width of the photo in pixels, all we have to do is set up a ratio and solve. Solving for x we get a hair over 0.4 degrees. Does that not send chills down your spine? No? Then you don't understand the conclusion. 2) The photo of the "Marfa Lights, shows streaks of light in the photo, which appear to be 0.4 degrees across the photo! The closeness of these two values is astounding and leads immediately to the conclusion that the streaks of light in the "Marfa Lights" photo must instead be CAR HEADLIGHTS from cars traveling at or near 65 miles per hour! In fact, if we redo the calculations for a car traveling 75 miles per hour, the expected apparent angular motion in that case matches that on the photo exactly, i.e., 0.4 degrees! As a matter of fact, 75mph is probably more likely than 65mph anyway. For you skeptics, let's talk a moment about the assumptions. Without showing multiple computations, which would surely bore everyone to tears, it turns out that all reasonable estimates for all the assumptions above, bounded by the potential extremes of the variables, all lead to estimates where the expected movement of car lights across the field of view closely match estimates from the photo. Even if the field of view of the photo was mis-estimated by as much as 7 degrees, the appearance of the white lights in the photo closely match what you would expect for cars traveling at 75mph. The point is, that the streaks of light in the photo reasonably "fit" car-lights, and DON'T likely fit any other conclusion. Had the calculations been far apart, i.e., not even in the same ball park, we could not draw this conclusion. In the Jagger photo of the "Marfa Lights" the lights are indeed car headlights on Highway 67. I with to thank the owner of the photo for responding to my e-mail query about its technical details. I must point out that I used the photo, and his comments on the cited web page without his permission, but copyright law permits this for the purpose of critiquing work. I mean no offense or harm to the owner, and I hope that none has come across in this analysis. In the process of tracking down the owner, I found he is a skilled and very capable photographer who has done some remarkable work! Return to details of the " Springs Lights"